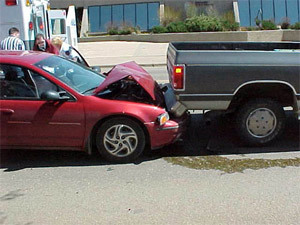 Getting into an accident is certainly something that everyone knows can happen. If you’re like me, you may spend at minimum 12 hours a week driving. This makes my chances of either being in a wreck or seeing a wreck very high. Last week, as I was inching along the toll road because of a collision a few miles ahead (the second one that morning in the same spot), the car in front of me ran into the truck ahead of him. He attempted to get out of his Toyota Corolla to check the damage and, I assumed, to talk with the man in the truck. However, the man in the truck didn’t seem phased. I thought maybe he was waiting to get out of the 4 lanes of what seemed to be a parking lot to pull aside. Once out of the mess, the driver in the truck just kept going as if nothing happened. There was damage to the hood of the Corolla, but since he was the one who hit the truck from behind, I suppose there wasn’t much that would happen since the truck wasn’t damaged. Is it OK to drive away in this circumstance? From what I know about accidents, it certainly is not. However, observing this situation makes me wonder! DefensiveDriving.com is your online driver safety solution! Log in today to become a safer driver, receive insurance reduction and for ticket dismissal. Call 888-545-5422 today to set up an account for your drivers!